Rosemarie M. Esber is an independent scholar and international development specialist. She is an oral historian with ongoing research projects about: the Palestinian refugees displaced in 1948; Arab Americans of the Southern United States; and Helen Thomas, the legendary White House journalist who covered 10 presidents and was fond of saying, "if your mother says she loves you, check it out!" 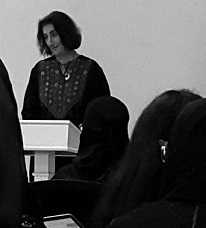 Dr. Esber was honored to represent the United States as a Fulbright Scholar in Jeddah, Saudi Arabia, where she taught oral history methodology at Effat University, a women's university in Jeddah founded by the children of King Faisal and Iffat Al Thunayyan. As a class project, her students recorded the life histories of older women to preserve an important aspect of cultural heritage. In addition to holding workshops on careers in international development for the university community, Dr. Esber worked with the Effat University Cultural Museum and Library on programming, which was a great experience professionally and personally. Dr. Esber is a consultant to international organizations, including the World Bank and UN Women where her work has focused on gender issues and human development, particularly health, education, cultural heritage, and women's employment. In collaboration with Alexandria, Virginia's Office of the Arts, she organized American Arabesque: A Celebration of Culture. The all-day event highlighted the diverse and rich arts and cultures of the Arab countries through music, an art exhibit, poetry, cuisine, and children's activities, with the enthusiastic participation of the Arab embassies. Dr. Esber received her PhD from the University of London, School of Oriental and African Studies, a MA from The Johns Hopkins University Paul H. Nitze School of Advanced International Studies, and a BA from Marietta College. She has field experience throughout the Eastern Mediterranean, the Gulf, and North Africa.